Body worn cameras for the general public! Body worn cameras for the general public - buy online now! Body Cameras are now available online to the general public across the UK & Ireland. Last week, Pinnacle Response launched their new e-commerce platform. PR5 Body cameras, both new and reconditioned models along with popular body-worn camera accessories, are now available to order online for the general public. The Pinnacle Response PR5 is the UK and Ireland’s most popular body worn video camera used by the Security Industry with over 20,000 units in use. The PR5 is a firm favourite with members of the public as demand for a serious video camera for both safety and recreational uses has grown dramatically over recent years. Firstly developed for Professional Security teams, the PR5 body-worn camera has now been incorporated into everyday scenarios, ideal for both professional and personal use. Body worn cameras provide a sense of safety and accurate evidence when necessary for door staff, lone workers, dog walkers and delivery drivers or to simply record picturesque or recreational HD videos for your own use. 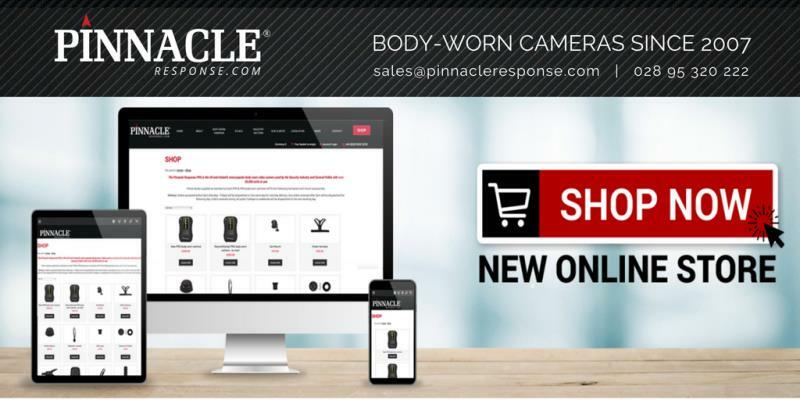 With unparalleled performance and ease of use, the PR5 body-worn video camera incorporates all of Pinnacle Response’s market-leading expertise in body-worn solutions. Whether you require video evidence or a robust personal use video camera, invest in a Pinnacle Response PR5 video camera offering over 5 hours HD recording time. Simple Design – one-touch activation and permanent standby makes the PR5 extremely user-friendly. 12-month battery standby – when fully charged, the PR5 will hold its standby battery charge for more than 12 months. Most cameras have no more than 72 hours standby capacity. 720p HD audio and video – Ultra clear audio and 720p video and quality is comparable to most 1080p cameras offering more efficient memory storage. Tamper-proof Design – non-removable battery and secured internal memory makes using the PR5 safe and secure. Plug and Play enabled – the PR5 is set up for immediate deployment and ease of use straight out of the box. Drop tested – the PR5 has been certified to a 3-metre drop test onto a concrete surface. IP45 Rating – water resistant and dust resistant, the PR5 is dependable even in the harshest environments?